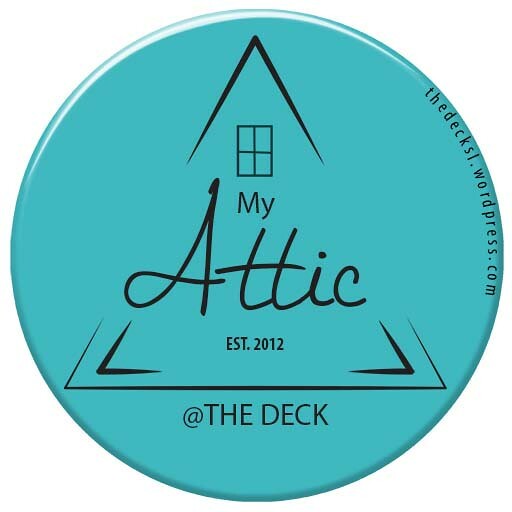 This is the last day of My Attic @ The Deck for this session. 15 stores have all created something to the theme of Shaken not Stirred. All items are only 95L until midnight SL, which is 21 hours roughly to go. Do not miss out on these great bargains, and please add your pictures to the My Attic flickr Pool. Honey Pose Pack by Adorkable Poses. Pepper Dress (mesh) by BOOM. Billow Tube Top (mesh) by Cracked Mirror. Tracey Hair (partial mesh) by EMO-tions. Ingrid Hair with hairbases HUD controlled texture change headband by Mina Hair. August Pose Pack by Miseria. Cocktail Hour Lipstick (tattoo layers) with and without teeth by Pididdle. Attic Boho Bag (mesh) by Toki Doki. Demos set up on back verandah at My Attic. A reminder of things happening at The Deck. First off there is not much time left to get all your Adorkable Poses at the 50% OFF Sale that ends on the 26th, so do not miss out on that. Then you have all the wonderful items at this session of My Attic. 15 stores have all created something to the theme of Shaken not Stirred. All items are only 95L while this event is on. My Attic @ The Deck opened yesterday, and will be on until the 31st of August. I hope you will join us for all of these beautiful items that are only 95L for the time that they are featured at this event, so definitely worth visiting more than once and making sure you get everything. The theme is Shaken not Stirred, and following are the pictures of each item at the event. 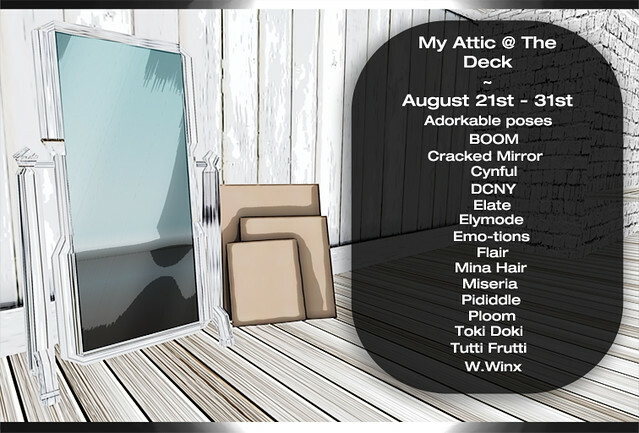 My Attic @ The Deck for August 21st – 31st has begun. The theme is “Shaken not Stirred” and there are 15 Designers at this session including a collaboration ring in – me – so be sure to come by and check out all the items that will be for sale for 95L only during this event. Pictures will be posted through the day. Hope to see you there. 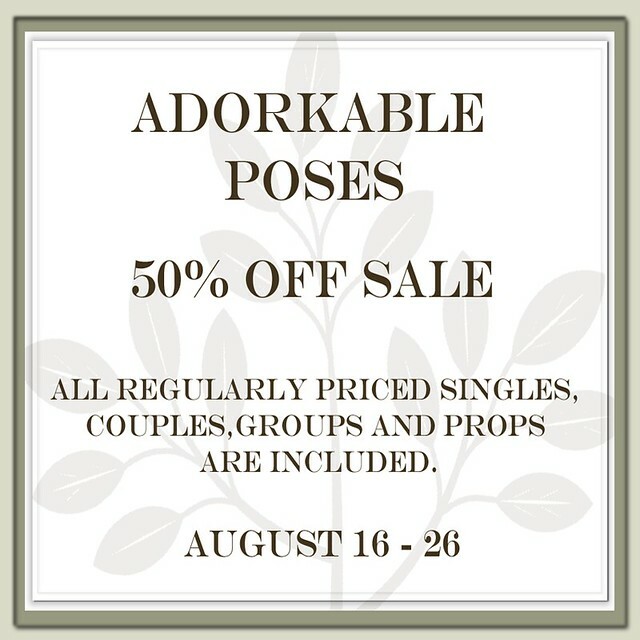 SALE on now until 26th of August at Adorkable Poses Mainstore @ The Deck. Come and see all the fabulous poses packs, props and couple and group pose sets available at a great reduction. Maitreya has updated their The Deck location with a range of their recent Mesh releases. Clothing and Footwear all have demos available to try before purchase, wonderful leathers and prints and more. New Mesh dresses now at the Miel store at The Deck, these regatta dresses are customisable using the HUD provided, try the DEMO available in the store. Many colour options in the six different packs available.